Mid Back Pain in Mississauga? When people think of Chiropractors, most think of treatments for lower back pain. Low back pain is definitely the most common complaint treated by Chiropractors, as it affects up to 31 million North Americans at any one time, and up to 80% of the population will experience debilitation low back pain at some point in their lives. Of all potential causes, disc herniations are probably the least likely reason for mid-back pain. Not only are they rarely found in that area on MRI images, but even when present, they are often asymptomatic. One of the reasons is because the mid-back does not have to support as much weight as the lower back does. Plus, the mid-back has a ribcage attached to it (decreasing its mobility). Without excessive movement in this area, disc bulges are less likely to occur. Ribs are another potential source of pain. Every vertebra of the thoratic spine makes a connection with up to four ribs (the first and last vertebrae of the spinal column only attach to two each). Fractured ribs can occur when a person experiences direct trauma to this area- it is an extremely painful condition, and could lead to complications such as a punctured lung. If you suspect your rib is fractured, go to the hospital immediately. Finally, consider this: the mid-back area is also where the diaphragm connects (the largest, most important breathing muscle). So, if you have mid-back issues, getting Chiropractic care could be as important to your health as the very air you breathe! Many episodes of mid-back pain result from injury, overuse or misuse. Abnormal spinal alignment or degeneration of normal structure can also lead to mid-back pain. “The precipitating mechanical problem commonly leads to inflammation, and the inflammation leads to pain”. When spinal bones become misaligned or movement is restricted, the result is a common condition known as vertebral subluxation. Vertebral subluxations in the mid-back are linked with a myriad of health conditions. Your Mississauga Chiropractor corrects vertebral subluxations with specific chiropractic adjustments utilizing the Activator Technique. During a chiropractic adjustment your doctor in Mississauga specifically adjusts the misaligned vertebrae “back into place”. This process rests the connecting muscles: a vital step in reducing the patients’ mid-back pain and improving mobility. Even ribs can become misaligned. Subluxations in this area often result in “trigger points” of pain, causing the smooth muscles around the ribs to kink and knot. The sharp, jabbing nature of the pain can mimic heart burn or even a heart attack. What causes rib subluxation? Sleeping on the same side night after night may result in this painful condition. Other instigators include everyday activities like coughing, lifting or throwing a ball. Chiropractors specifically manipulate the subluxated rib back into place. If you want a healthy pain free back, pay attention to your posture. Scrunching down in a chair while watching television or slumping over a computer keyboard predisposes the thoracic spine to exaggerated curvatures. Even five or ten pounds of excess weight can trigger postural misalignments: particularly abnormal weight, which tends to pull the body forward. High heels, fatigue and aging also take a toll of posture. Regular exercise encourages good posture. It not only relieves stress, but it also strengthens the spine and improves alignment. Ask the Chiropractor to suggest an exercise regimen aimed at enhancing posture and strengthening vital muscles. Researchers found that the risk of back pain was moderately increased among employees with intensely demanding jobs, high levels of job dissatisfaction and stressful scheduling demands. 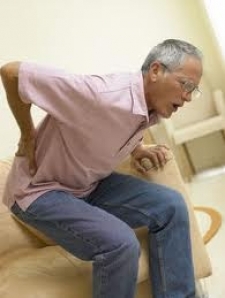 While the largest percentage of mid back pain falls into the “chronic” category – instigates by daily activities gone awry – traumatic injuries occur as well. And when they do, doctors of chiropractic restore patients to health with the same safe and gentle maneuvers they use for chronic conditions. It’s also important to note that mid back pain may indicate the presence of osteoarthritis. A chronic degenerative disorder, osteoarthritis is characterized by cartilage loss: resulting in pain and stiffness. That’s why it’s important to let your chiropractor know if you are experiencing either of these symptoms. In severe cases, osteoarthritis of the thoracic spine results in “hunchback.” Regular chiropractic care may ward off this disfiguring condition before it takes hold. Don’t wait for your pain to be your “wake up” call. Make an appointment with your Mississauga Chiropractor today for a complete physical. Your mid back and entire body will thank you!